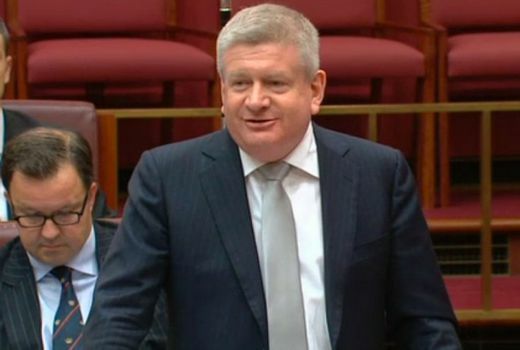 The Coalition party room has cleared media reforms proposed by Communications Minister Mitch Fifield, who will introduce legislation tomorrow to repeal two regulations in the Broadcast Services Act. Fifield has proposed abolishing both the reach rule, which prevents mergers between regional television networks and their metropolitan affiliates, and the two-out-of-three rule, which stops any proprietor from owning a newspaper, radio station and television network in the same major market. “The media laws that we have were drafted in an analogue world and for an analogue world,” Fifield told reporters in Canberra. Extra local content obligations will be imposed on regional networks to sustain local production if they are acquired by or merged with another company, taking effect six months after a merger “trigger event”. This will comprise two points for new content relevant to a local area or three points for material that includes local footage. The anti-siphoning list remains unchanged. “If anti-siphoning was to be addressed I think it would need to enjoy broad support in the parliament,” he said. Labor has been willing repeal the reach rule but has yet to back repeal of the two-out-three rule, meaning crossbench support may be critical to passing the legislation. Support from media has been divided. News Corp and Seven West Media have been critical of the proposal. Tim Worner, Managing Director and Chief Executive Officer, Seven West Media said, “Media ownership changes might be great for the deal junkies out there but they are not going to ensure a strong future for Australian film and television production. You won’t see one more minute of local content as a result of these changes, in fact you will probably see a lot less, especially in regional Australia. “It’s disappointing that the Government has not walked the talk when it says it wants to focus on innovation and the future. But Ten Network Chief Executive, Paul Anderson, said: “Removing these archaic media laws is an important first step in dismantling a set of rules that are making Australian media companies less competitive in a global, converged media market. “Ten Network is now competing directly for viewers and advertisers against large, global internet companies that are exempt from local media regulation, don’t pay television licence fees, pay minimal corporate tax despite taking billions in advertising revenue in this market, and in some cases don’t have a single local employee. “Meanwhile, we pay the highest broadcasting tax in the world on top of our normal corporate taxes and we are held back by media ownership rules that don’t even recognise the existence of the internet,” he said. “We welcome the Minister’s comments about addressing the onerous television licence fee regime. “Addressing television licence fees and updating media laws are essential if we want to see a vibrant, diverse and competitive Australian media industry going forward. These changes are critical and urgent if we want to retain local voices in our media and a local content production industry,” Mr Anderson said. I think Tim Worner is actually starting to believe his own twisted spin on the subject. I feel sorry for regional viewers they will loose all local content take nine network if nine buys WIN there is no way nine will continue with producing local news for its regional viewers the three hundred people in Wollongong that win to employs will lose their jobs jsut a small sales team will remain .its all about shareholders and profits for nine.regional centres only have one to station and one paper Fairfax has already killed off local news in its papers to to follow. The ABC should be made to provide local, news to regionals . If Bruce Gordon sells off his stake in Ten and checks down the back of all of his couches, it could be him (WIN) that buys out Nine. He already has around 15% of Nine. For the avoidance of misunderstanding, I don’t know who the other Laurie is who seems so unhappy with Seven. It’s not me and I doubt it is Laurie Oakes. At least I use my full name. It is a competitive world commercial television and if you owned shares in any of the FTA’s you’d hope they were doing their best to make a profit and provide you with a decent dividend. Seven might not think the new media laws are to its liking but don’t forget that Kerry Packer stopped Pay-TV launching here for two decades or more through successfully lobbying in Canberra. And you couldn’t argue back then that he wasn’t looking after the Nine Network’s best commercial interests either. Ten complaining that digital players such as Netflix and Fetch don’t pay a spectrum license fee when they’re not using any spectrum. If Netflix has it so easy, why doesn’t Ten charge people $10 a month to access their content via VoD? Not sure who would pay for FTA titles. Daryl tried that with old Hey Hey eps. Exactly the point I was making with that last sentence. Nobody in their right mind would pay actual money for most of the drivel served up on Aus FTA TV. They complain about Netflix having an easy ride but the reality is that Netflix offer a superior product. Seven owns 14.9% of Prime and they have working arrangement that suits Seven, so they are happy with the status quo and don’t wan’t Nine and Ten to gain by taking over regional affiliates and forming national networks. A vibrant competitive industry relying on billions of dollars in subsidies through spectrum and government funding to make shows. The laws will have little effect on regional content. It will provide and incentive to film some local events instead of just reading out local news from studio elsewhere. Trust Seven to have a negative comment they still annoyed because they had to switch from B/W to color!! And they still have no news on the HD switch over typical Seven!